As a leader in the decorative concrete and paving field, our name has become synonymous with quality work and dependable service. 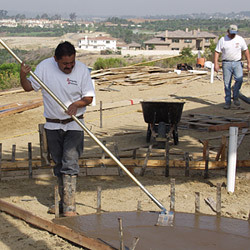 Our willingness to do what it takes to get the job done and stand behind our work has made Integrity one of San Diego's largest and most successful hardscape contractors. examples of our projects, be sure to check out our commercial and residential project galleries. For company licensing, bonding and insurance information, click here. A diversified company with divisions in concrete, interlocking pavers and masonry, Integrity has the capacity to meet all your project needs. Clients appreciate the fact that we can provide a complete package of services from demolition and removal to fine grading, installation of specialized concrete surfaces, custom paving and masonry, and decorative saw cutting. examples of our projects, be sure to check out our commercial and residential project galleries. For company licensing, bonding and insurance information, click here. Our clients range from individual homeowners to major homebuilders and commercial General Contractors. The quality of our work can be seen in projects throughout Southern California, including the most prestigious areas in Orange County, Palm Desert, and coastal San Diego communities like Rancho Santa Fe, La Jolla and Del Mar. We also have extensive experience constructing parks, apartment complexes and commercial buildings. For examples of our projects, be sure to check out our commercial and residential project galleries. For company licensing, bonding and insurance information, click here.